GQ (left) as Iago cuts a deal with Postell Pringle as Othello in Othello: The Remix. Top: JQ, Pringle, GQ and Jackson Doran as the ensemble for the rap version of Shakespeare's play. As one of Shakespeare’s most famed tragedies, Othello has seen quite a number of adaptations over the years. The artistic duo Q Brothers take their stab at adapting this timeless play with Othello: The Remix, which discards Shakespeare’s original iambic pentameter in favor of modern rhyme set to rap music. In the spirit of Hamilton and other sung-through and hip-hop-infused musicals, Othello: The Remix is 80 minutes of fast-paced lyricism—spun live by cast member DJ Supernova and with hardly a breath in between. While there are a few questionable production choices, the massive amount of creative energy and impressive talent on display in Othello: The Remix make it hard to resist. Othello (Postell Pringle), is a hip-hop purist betrothed to his musical muse, Desdemona (who is never physically present in this production, but represented by ethereal vocals and lighting). Othello’s envious nemesis, Iago (GQ), spins a web of deceit among Othello’s goofy best friend and pop musician, Cassio (Jackson Doran) and Desdemona’s nerdy suitor, Roderigo (JQ). As in the original play, Iago succeeds in turning Othello against himself, but the Q Brothers are liberal with humor and slapstick in depicting the Moor’s iconic downfall. Donning quick-change costumes such as caps and wigs, the cast goes for caricatures rather than depth, which elicits a lot of laughs but does prevent the production from striking many of the deep, philosophical chords embedded in Shakespeare’s original text. While The Remix’s moments of lowbrow humor obscure some of the textual beauty of the original, it is a worthy tradeoff in the end. Originally commissioned for the 2012 Globe to Globe Festival in London, Othello: The Remix does feel like a festival piece in the sense that it achieves a broad, wholesome audience appeal. Rather than get bogged down by the original play’s existential themes, this adaptation opts for a hammier approach that is more fun in performance. Its lightness is achieved by playing up the humorous rhyme schemes and creating exaggerated characterizations of music industry types. While most of these ridiculous characters are admittedly funny, some do lean a bit heavily on tacky stereotypes (such as Bianca, Cassio’s clingy Latina girlfriend). 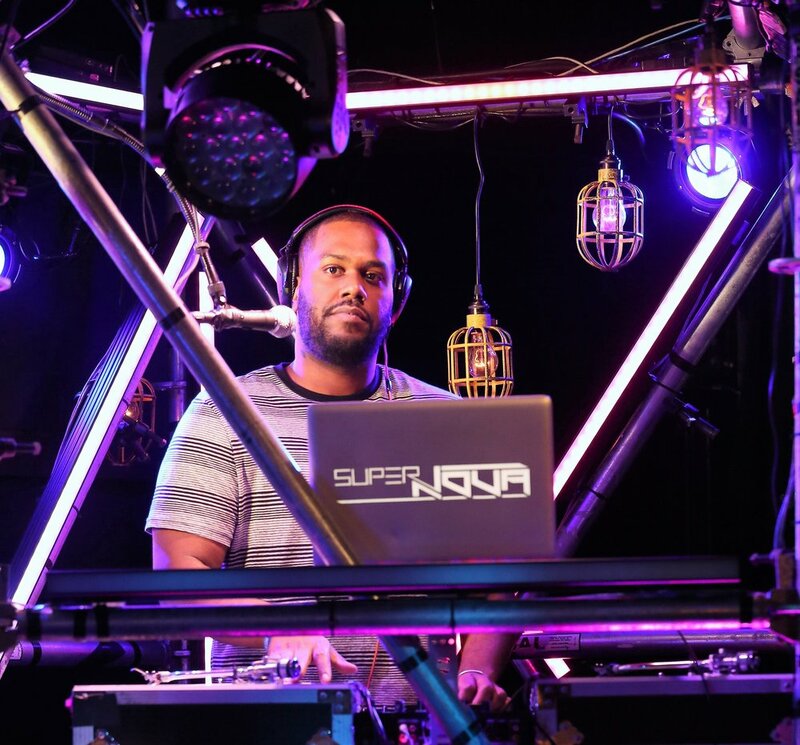 DJ SuperNova live-spins the entirety of "Othello the Remix." Photos by Carol Rosegg. The small, all-male cast is especially ridiculous in their drag roles, which are enjoyable despite the glaring issue that there are no actual women in this production. This is obviously a directorial choice, as all of the women in Othello are double cast; JQ (Roderigo) plays Bianca, and Doran (Cassio) plays Iago’s wife, Emilia. Suffice it to say that Othello: The Remix does nothing to critique the misogyny ingrained in Shakespeare’s play. Then again, the production makes no claims to breaking down any gender barriers at its outset. As a rap musical, lyrics take center stage in Othello: The Remix; therefore, the production’s costumes and set design are kept rather minimal and uncomplicated. Keith A. Truax’s lighting design, however, plays a crucial role in highlighting the emotional shifts between scenes. Operating in perfect sync with the musical score, Truax’s work helps create particularly sublime vignettes, such as Cassio’s intoxication scene and Desdemona’s dramatic death.These earnest moments make up for the production's cornier bits; overall Othello: The Remix is worth seeing for its cast's verbal and physical dexterity and its smattering of guilty pleasure gags.